Want to completely transform the exterior of your home and give it added kerb appeal? Maybe you want to create a modern, clean contemporary look to your home which isn’t going to cost the earth but increases its value? If this is the case then cladding your house could be the answer you’ve been looking for, it adds a splash of colour and instantly transforms your property. We can offer several makes of cladding including Marley Cedral board and HardiePlank®. By opting to clad your home, you are making a statement and creating a piece of art. Your house is sure to be the talk of the street and for all of the right reasons. Cladding is not only in available in a choice of many beautiful colours but also has the added benefit of protecting the exterior of the building underneath. 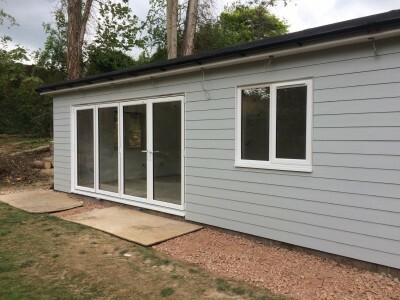 For more information and details on Marley Cedral board, Hardieplank® or any other exterior covering, including render and uPVC cladding, please contact us or visit our Hertford showroom. Download a Marley Cedral brochure.